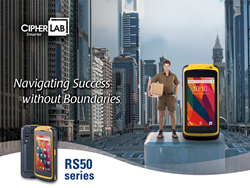 CipherLab, a leading innovator in Automatic Identification and Data Capture (AIDC), proudly presents the RS50 Rugged Android Touch Computer to provide productivity that meets high-end market standards with a smartphone user-friendliness. Operating with Android 6.0 certified with GMS, the RS50 series offers advantages in operation speed, power efficiency and data security. Integrating GMS (Google Mobile Service), users can also access applications such as Gmail and Google Map in the field for maximum output. Along with the similar smartphone operation experience, the RS50 series has the ability to capture 1D and 2D barcodes within milliseconds. It also has the ability to read and write HF RFID while supporting contactless NFC applications of peer-to-peer mode and card emulation. RS50 series’ 8MP camera allows users to capture high-resolution photos and videos for efficient proof of delivery and service. Businesses can streamline their data collection with one simple yet powerful device. For more details and specifications regarding CipherLab Mobile Computers and Barcode Scanners or request for demo, please email us or contact our office at 888-300-9779 by phone.